Bananas are one of the few fruits that can be bought all year round. They are harvested in exotic climates and shipped all over the world for our enjoyment. While at the super market you usually will want to pick a group of bananas that have a green or light green tint to them. They should be firm and have no visible bruises on them. They aren’t ripe yet but will be in a few days and ready for consumption. The freshly bought light green bananas should be stored in room temperature. Bananas release a high concentration of ethylene gas so they should be stored separately from all other fruits and vegetables. If they are stored near other fruits and vegetable this will cause all your fresh food to spoil faster. Bananas should also be hung up to avoid bruising during the natural ripening process. This allows you to keep your bananas for the maximum amount of time and avoid tossing brown bananas. 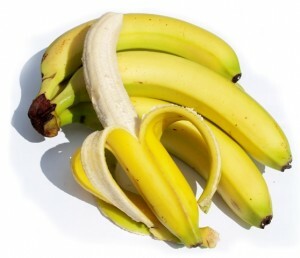 A banana is ripe and ready to eat once they are a sunny yellow color and are at their best when they are solid yellow and have small brown spots. Tip: If you have any left over ripe bananas cut them up and store them in a Ziplock bag in the freezer. They will last about a month and go great in smoothies! Never Store Near Other Fruits or Vegetables: Because of the ethylene gas they release they will spoil your other fresh produce. Never Store In a Plastic or Paper Bag: The ethylene gas will be contained causing the bananas to ripen much faster. You could do this if your bananas are to green and need them sooner rather than later. Never Store In The Fridge: Bananas aren’t used to the cold climates. Storing in the fridge will cause the natural ripening process to stop and the bananas skin will turn black while the insides won’t change much.